The Z50M was the first Z50 Series mini bike produced by Honda Motorcycles. 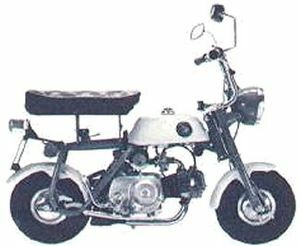 It was released in 1967 to the European and Japanese markets, becoming one of Honda's first practical mini bikes. Although the Z50M was theoretically road worthy, it did not have various safety components and was therefore mostly just used just for fun off road. Though these bikes are not extinct today, these mini bikes are some of the least common of the Z50 series left running. Sometimes called the "monkey bike"
This motorcycle, scooter, or moped-related article is a stub. You can help Cycle Chaos by expanding it. Contact User:Budlight if you need help. This page was last edited on 8 September 2010, at 12:28.